Most of our seed potatoes go to Cuba and the southern states such as Florida and the Carolinas. 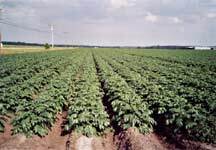 We also sell seed potatoes in Canada to some local producers, some in Ontario and Quebec. Brian travels to Cuba and also to the southern U.S. states every year to look after his market there. Brian will be traveling to Russia this year because we shipped a vessel of table potatoes there this past year. These potatoes were purchased from producers in New Brunswick. When we expand our export markets our goal is Central America and the Caribbean countries We have shipped a number of containers there in the past years. 75 % of our seed potatoes are the red varieties, 20 % are round or long whites and 5% are russet type.